In a 2015 survey, the National Institute on Alcohol Abuse and Alcoholism (NIAAA), part of the National Institutes of Health, reported that about 10 percent of Americans are living with a substance use disorder. Process addictions such as overeating, video gaming, and gambling are on the rise as well. Most of us know someone who has faced adverse consequences from addictive behaviors, perhaps even had our own struggles, sometimes with heartbreaking consequences. In this session on addiction, healthcare chaplain Melissa Thomson will address the basics of alcoholism and addiction, speak about how recovery processes and programs work, discuss psycho-social aspects of the diseases of addiction, and suggest caring, supportive practices for friends and family members of those living with addiction. Our UU belief in the inherent worth and dignity of every person and our UU tradition’s encouragement to spiritual growth can be great assets in navigating the challenges that come with living with these disorders. This session is open to all levels of awareness and interest. 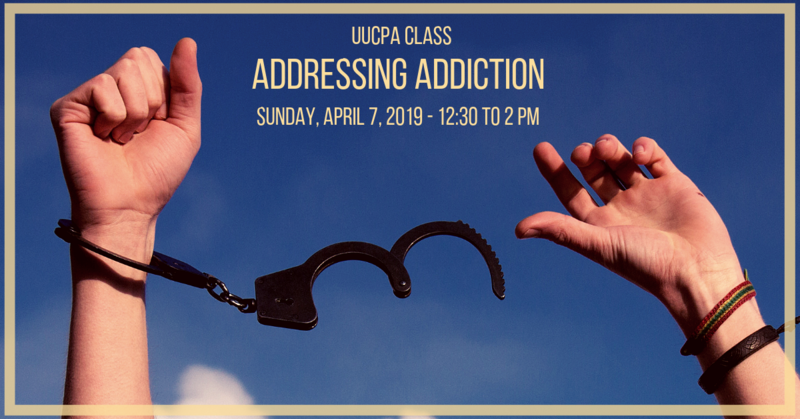 Privacy is important when speaking of addiction: no individual sharing will be required to take part in this session. Rev. Melissa Thomson serves as a chaplain at the Kaiser Permanente Hospital in Redwood City.